Product Specifications Easy to install and operate. Can be installed into a 2.75", 3.5", or 4" Junction Box OR any 5" or 6" Recessed Can Energy saving, Long lifespan. Light is soft and uniform, Safe to eyes Instant On, NO flickering, NO humming. 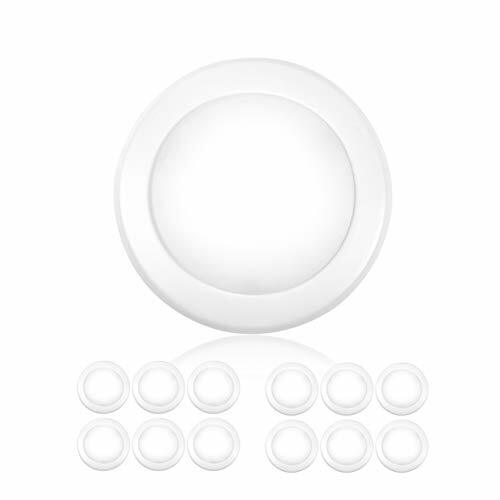 Dimmable with most LED Dimmers, Including Caseta Wireless Dimmers Green and eco-friendly without mercury. Certifications: Energy Star, ETL, Title 24, RoHS Compliant, FCC Color Temperature: 2700K, 3000K, 4000K, 5000K CRI: >90 Lumen: 1050LM Beam Spread: 120°. Optical design efficiently directs light output in an 120° beam angle with low glare. Input Voltage: 120V AC Waterproof Rating: Damp Location rated Housing Color: White Suitable for Damp Locations Warranty Time: 5 Years Fixture Weight and Size Fixture Weight: 0.55 lbs. Diameter: 7.25" Thickness: 0.6" Packaging Weight and Size 1 Pack: 0.7 lbs. , 7.8" x 7.8" x 2" (LxWxH) 4 Pack: 2.95 lbs., 15.8" x 5" x 8.25" (LxWxH) 12 Pack: 10.5 lbs. , 16.6" x 14.6" x 9" (LxWxH) Notice For User Turn off electrical power before starting installation of light fixture. The input voltage and lamps should be matched, after connecting the power line. This product must be installed in accordance with the applicable installation code by a person familiar with the construction and operation of the product and the hazards involved. Caution- risk of fire. Consult a qualified electrician to ensure correct branch circuit conductor..